A geeky teenage girl, true to her nature, grows into poet and the author of a classic diary, which is still popular in Japan, 1,000 years later. One thousand years ago an ultimate bookworm had a dream. The girl’s desire was to obtain all the volumes of the famous Japanese novel, The Tale of Genji. Today, she might be considered goth or a geek. Her aunt was the author of The Kagero Diary (or The Gossamer Years) and delighted her niece by giving her a complete set of The Tale of Genji. In those days, books were carefully copied by hand and passed around by chapters, as most early books were, so it was very special to receive a complete one. Sarashina (b 1008) became the poetic diarist of The Sarashina Diary. Two of the best-known luminaries of the golden age of Heian Japanese female poets and authors were Murasaki Shikibu and Izumi Shikibu, who were not related but rivals (Shikibu is the court title of their fathers). They were ladies-in-waiting at the imperial court in Heian-Kyo (Kyoto) and severed Empress Akiko. Murasaki wrote The Tale of Genji, the first novel in the world; it is as relevant to Japanese culture as Shakespeare’s plays are to Western culture. Izumi was an exceptional tanka poet who wrote The Diary of Izumi Shikibu. Both authors interspersed their writing with original poetry known as waka. Their main topics were descriptions of lives full of intrigue, ambitious men, lovers and castaway wives. Poetry was an essential way to communicate with aristocratic families between friends, lovers, and relatives. Instead of a letter, they sent poems. Sarashina wrote the following poetry called waka (song) that appears in Haruo Shirane’s Traditional Japanese Literature. Professor Shirane teaches in the East Asian Languages and Cultures of Columbia University. Sonja Arntzen translated each 31-syllable waka (now called tanka) below. Arntzen is professor emerita of literature at Toronto University and the University of Alberta. in this world of ours? The author wrote The Sarashina Diary when she was middle-aged, yet this autobiographical diary begins in the voice of a thirteen-year-old and flows with young-hearted awe and enthusiasm towards what she loved: her father, her books and the outdoors. Her writing reveals how she tried to follow her parents’ desire to be useful at the court of Empress Akiko, yet when she gave up the court position, she was true to her nature as a shy girl who was content with books and daydreams. Finally, her parents let her stay home and did not pressure her to marry early. Later, when Sarashina marries at age 31, she seems to have become content as a wife and mother. As her diary progresses, the author’s voice changes to that of a middle-aged woman, tinged with the melancholy of a widow, who soon has to cope with an empty nest. Even though she feels abandoned, the poet persists in her writing and goes on pilgrimages to temples on a quest to find eternal life. At a time in Japan when male authors wrote in Chinese ideograms (kanji), female authors wrote entirely in the native Japanese script, kana. Chinese ideograms for the Japanese language, include thousands of characters that require years of memorization. However, kana (hiragana and katakana) represent the phonetic syllables of the Japanese language. Because of the relative simplicity of kana and the popularity of the more psychological writing style of women, their writing became more widely read than men’s during the Heian period. Women’s poetic diaries held such esteem that one of the top male poets, Ki no Tsurayuki (b 872), wrote The Tosa Diary in the voice of a woman writing in hiragana. The Sarashina Diary is the most autobiographical of the Heian poetical diaries as it includes the long expanse of the author’s life. 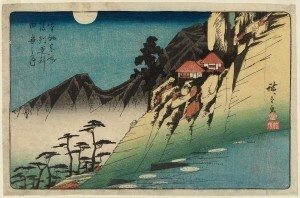 Shirane states, “The travel account was first written in the viewpoint of a thirteen-year-old girl, and was unique [for that time].” He continues, “It also addresses difficult issues in a complex manner” such as fiction and reality, the capital vs. country life, and darkness and lightness. The real name of the author and poet is unknown; instead, the Sarashina is the place where her family once lived. Her father was Sugawara no Takasue, so she was also called “Takasue’s daughter.” In any event, this author’s fame and those of her more famous literary colleagues, Murasaki Shikibu and Izumi Shikibu, has lasted for 1,000 years. Miner, Earl. An Introduction to Japanese Court Poetry. Stanford, CA: Stanford University Press, 1968. Shirane, Haruo. Traditional Japanese Literature: An Anthology, Beginnings to 1600, New York: Columbia University, 2007.